Why do floor coatings peel? The first and most likely reason is because of poor concrete preparation prior to the installation process. When car tires are hot or wet they tend to become sticky, sticking to your garage floor coating. Upon backing out of the garage, the floor leaves with your tires because the tires were bonded to the coating better than the coating was bonded to your concrete. Improper preparation can come in many forms. The substrate not having a rough enough profile for the material to bond to is the most common mistake inexperienced or slipshod installers make. Epoxy type coatings will not bond to smooth concrete. The other problem is not having the concrete clean enough. Dust, salts, and other residues will act as bond-breakers and not allow the coating to adhere to the substrate. The second reason is because of poor material quality. Not all epoxies are created equal!! There are many additives and raw materials that can be used to create an epoxy or urethane giving the materials different durability and chemical resistance properties. The material that has the best impact resistance may not be the same material that has the best chemical resistance. It helps to have an experienced company that knows the differences and can determine what type of flooring is best suited for your needs. Both of these preparation methods can be effective in preparing a concrete substrate for a new epoxy coating, but both can also have drawbacks. Acid etching works because the acid/water solution reacts with the concrete surface removing a thin layer of the concrete and exposing the rougher sandy surface underneath. This method only works if the concrete has never been sealed or coated. It is usually inadequate for commercial power-trowelled concrete because of the tight matrix of the finish. Diamond grinding is another way to prepare a concrete surface for a coating. 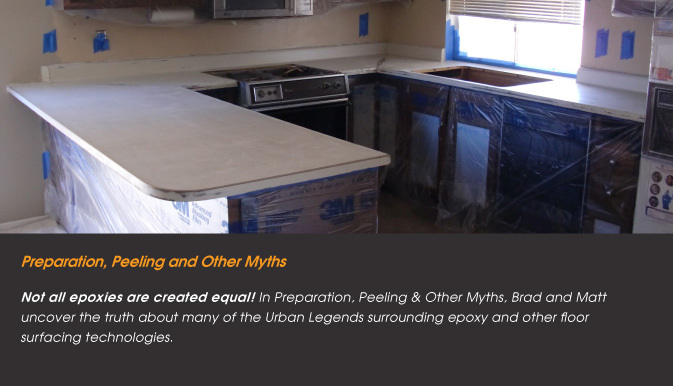 This method is most often used when an area has already had a coating or sealer applied that needs to be removed. Although an adequate profile is achieved through grinding, it is a very dusty process that can lead to coating failures if not properly cleaned afterwards. The fine concrete dust needs to be removed from the pores of the concrete by rinsing with water; otherwise your coating will be bonding to a layer of dust rather than the concrete itself — Think about your patio or pool deck after a dust storm. It only comes really clean with a broom or leaf blower and always needs a rinse. Beware of “ONE DAY FLOORING” companies that claim that acid etching is wrong, or that vacuuming the floor after grinding is all they need to do before coating. This ideology is usually embraced because they are using materials that are moisture sensitive and dry even faster when exposed to moisture or higher humidity. Without the proper soak time, the material will only stick as good as a damp Band-Aid, and unfortunately, peel off like one too. Read the fine print!!! These too-good-to-be-true lifetime warranties are usually just that. When you actually get into them, they only cover certain types of peeling or delamination for the lifetime of the floor, and the rest of the workmanship, fading, tire peel, etc. are usually much shorter… if even covered at all.